The man responsible for those words is Sir Winston Churchill, a man for his times. Notice he says “those who would do us harm,” not those who did us harm. Many think we need a man like Sir Winston Churchill who understands our times and acts in light of that reality. We have an interesting political battle going on as we have released our interrogation methods, yet refuse to put them into the context of the information received or circumstances in which they are used. This unfairly politicizes the issue- trying to make things black and white when they are a little less so. This quote from Sir Winston is at the beginning of Vince Flynn’s latest Mitch Rapp novel, Extreme Measures. It is a novel for these times, trying to explain why it is important to have such rough men ready, for there are despicable men who hide behind religion to exploit others and protect themselves as they wage a war of terror on civilians. 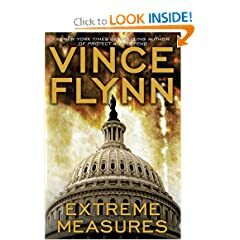 Yes, Vince has found a formula that works (though he deviates from it at the very end of this novel), but I enjoy his books. I do want that man out there protecting my family from those who would harm them simply because they live in America. As Christians we can often confuse the issues, misapply Scripture and really be muddle headed about these issues. Emotions can cloud the issue on both sides. First, there is a difference in Scripture between the response of an individual to unjustice, and the response of a government. We see that clearly in Romans 12 – 13. The individual is not to seek revenge, but entrust such justice to God. The government, on the other hand, bears the sword to punish evildoers. Turning the other cheek is about insult, and again is the individual forsaking retribution. This would not rule out self-defense should one want to physically hurt you. Context is key. We see something of a wartime ethic in Scripture. Both the midwives and Rahab were blessed for deceiving those who sought to perpetrate evil. Truth is not a black and white issue- sometimes we have to consider what will be done with the truth. Will they use the truth to rob, steal or kill? The context of “speaking the truth in love” is the covenant community moving toward maturity. You can lovingly speak the truth to an evil person by calling their actions what they are, while refusing to divulge the information they want. The righteous man/person resists the wicked. He does not stick his head in the sand and let them commit great sins against others. This is because God is seen as the One who defends the defenseless. As those being renewed in God’s image, we are to act like Him. We are to defend the defenseless, protect the poor, care for the widows and orphans. It has been an unusual month as I have preached in 4 very different congregations. Obviously each has its strengths and weaknesses, but all were meaningful times of worship. The first was a suburban church that has been struggling the last few years. The facaility was built in the 1990’s. The congregation was about 130 or so. They were mostly empty nesters, with a few families with children. The worship style was blended, with an emphasis on the 1970’s and 80’s. They used a piano, guitars, saxophone and song leaders. They had some traditional elements as well- call to worship, pastoral prayer, responsive reading from the Westminster Catechism and a benediction. The second was a smaller suburban church of about 50. There seemed to be a relatively even age distribution. Musically they were also blended, but drew from the 90’s and 2000’s. The only instrument was a piano and they had some song leaders. They had similar traditional elements. Though smaller, they sang louder (or at least it filled up the room better). They were a bit less reserved, yet more formal in their dress. The third was an urban church of about 100 that met in an old theater. The building had lots of character with the old brick walls. It was darker, with lights on the stage area. It was decidedly upbeat, with more of a free church worship style. The worship band was very good and included keyboards, electric guitar, bass, and drums in addition to the song leaders. The congregation was multi-ethnic, but the songs drew largely from the last 2 decades. The people tended to be younger. The fourth was also an inner city church of about 50, which met in an old church building. It had lots of character, like a small cathedral. It was nice to sit in pews. It was also multi-ethnic. It was also a less structured service, but they also recited the Apostles’ Creed and the Lord’s Prayer to keep in touch with our heritage. The worship team was a guitarist, electric bass and 2 singers. The music focused primarily on the holiness and grace of God, drawing on music from the last decade. It is wonderful to see the rich variety of congregations, facilities, and worship styles. Too often we get stuck in our own little world. I’ve enjoyed being enriched by the Body of Christ as I sought to enrich them with the Word of God. It is encouraging to see God at work in a variety of situations. Going into this season most people, Cavman included, thought starting pitching was the Red Sox greatest strength. I didn’t think the offense was as “average” as some people. But so far the starting pitching has been the weakest link, despite numerous injuries to key position players. We have seen Lowrie, Lugo, Kotsay and now Youkilis on the DL, with games also missed by Ellsbury, Drew and Papi due to injury. Despite the games missed, the Sox are still 21-13 which would put them in first in most divisions (well, the Blue Jays have barely played any AL East teams). No thanks to the starting pitching- Wakefield excepted. Lester and Beckett have been greatly disappointing. I think it is time to bring up Clay Buchholz who continues to dominate as he did in Spring Training. This puts Masterson back in the bullpen where he is most effective. When Dice-K gets back, give Lester and Beckett some rest. They obviously need time to either rest or figure something out. Go to a 6 man rotation, I don’t know. But if the Red Sox have average starting pitching they would have a better record than the one they already do. That speaks volumes about the fantastic job the hitters and bullpen have done, with the exception of the recently designated for assigment Javier Lopez. I suppose they could just keep doing what they are doing. But, will that help Beckett (6.42), Lester (6.31)and Penny (6.9) get back on track. Seriously 3/5 of the rotation with ERAs over 6- two of them aces???? It is a miracle they aren’t hanging out with the Rays and Orioles. I am grateful for this miracle, but we can’t expect to keep winning consistently unless we get better starting pitching. Update: the Herald’s John Tomase agonizes over this after another lousy start by Lester.